Burning the heather, originally uploaded by DragonDrop. So this was a lovely moment at the end of a walk we did on Sunday, over Kexgill Moor near Blubberhouses, Yorkshire – a fantastic expanse of old moorland. 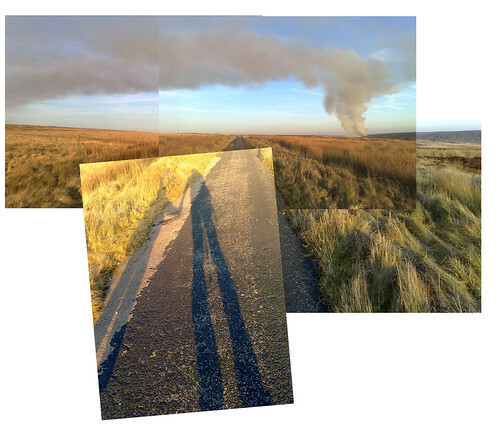 They were burning the heather – always a fascinating sight when you’re up on’t moors. We went on this walk, which I’m going to name “Kexgill Moor Short Walk” for the sake of reference, where I wanted to investigate a swimming pond someone had told me about. The joy of walking to me, is the exploring, the adventure, the seeing of new things. The pre-amble to this is an activity I love – scouring the O.S. Map, which I did. Initially, it looked like quite a bland walk from the map. I was a bit wrong. So post map scourage, where I’d thought thought “ahh ha, that must be it” (Grid ref: SE 129 552 GB Grid) we set out. After a warning to the kids of the perrils of straying from paths in the past, I now had to tell them we’re going proper off road, through open moorland to get to it. We parked next to Kex Gill road, and walked back down the Roman road to the gap in the wall on the right. Headed in a NW direction for about half a mile over lumpy mooland, we came to the pond (Foulcauseway Slack pond?) An ‘un touched by human hand’ pond on the top of a hill. It turned out not to be the same pond my friend was refering to, but never mind. Quite an odd place. Northing disturbed the natural barron landscape bar a collection of grouse shooting hides. We hung out a this pond for a bit – it’s about 100m long so didn’t take long to see it all. Took a few snaps, moved on again in a NE direction to pick the path up at Ramsgill Head. From here we followed the path leading SE. – quite a weak and untrodden path. Lovely scenery, going through everything from screen to grazing land, through reed to heather and goarse. Near the Old Intake Beck, wall I saw this carved stone sign saying ‘to skipton’. Quite suprised that anyone would go to the trouble of making a sign on such a remote path. My strongest guess is that it was carved pre 1960’s when the path may of been more trodden – it is on what would of been the main path between the now flooded West End village and Skipton. We plodded on, the path took us through a sheep station and round to Kexgill Farm. From here, we picked up the (now closed to trafic) old Roman Road which would have been a main road, from Aldborough to Ilkley (according to this map). Because a lot of the moorland hasn’t changed in a good long while, it’s possible to pick out bits of the road quite clearly (as per this photo, I took ages ago – another classic roman road and you can see, in the background the road going on over what is now moorland). After a half mile or so we were back a the car. A nice walk, away from civilisation is one of my favorite things to do.. and slowly but surely, I’m convincing the boys it’s cool as well. Sophie, at the moment still has no choice, as she’s strapped to my back! Anyway – lunctime blog windown is now closing.